The 2017 24 Hours Karting mostly kept its promises. The standard of the 33 competing teams and the variable weather contributed to the sporting value of the 32nd edition of this unique event in endurance Karting. At the end of the two times round the clock in the Sarthe, the Rouen GSK 1 team took 1st place in front of CRG Spa and Sodikart. Since 2016, the 24 Hours Karting has been listed on the international calendar as the CIK-FIA Endurance Championship. This recognition attracts kart manufacturers who are directly involved through their official teams. 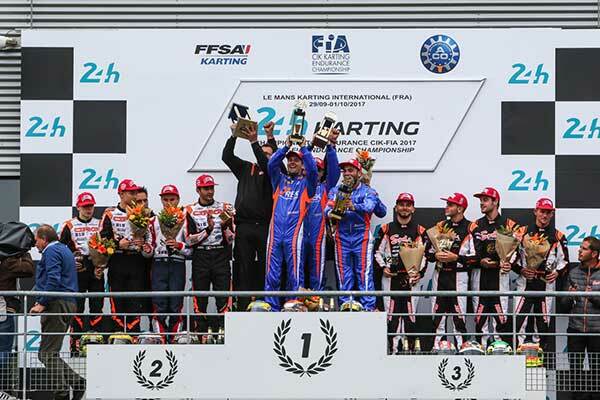 Already present in 2016, the CRG factory came close to victory before finally climbing to 2nd place on the podium in front of the team of the world’s leading kart manufacturer, Sodikart from France. Nevertheless it was a private team composed mainly of amateurs which imposed itself at the end of the 24 hours: Rouen GSK 1 who won with a Sodi chassis. On Saturday 30th September at precisely 3pm, in magnificent weather and in front of a large crowd, Mr. Kees Van De Grint, the Vice President of the CIK-FIA, lowered the tricolor flag to start the race alongside Nicolas Deschaux, President of the FFSA, Mr. Pierre Fillon, President of the ACO, and Mr. François Bourdin, President of ASK ACO. The wild beasts were finally released for 24 hours of fierce struggle. The duel started immediately between No. 6 CRG Spa (CRG / Parilla) and No. 1 Sodikart (Sodi / TM). But starting from the fifth hour, No. 16 CMCR Charente MMA (Tony Kart / Vortex) took the lead, overcome in the evening by No. 55 Rouen GSK 1 (Sodi / Vortex). Rain began to make the track slippery in the middle of the night and the dramatic turns were multiplying. The No. 91 Gamatt (Tony Kart / Vortex) moved up to 3rd place while several favourites faced technical and sporting problems. In the early morning, when the humidity persisted, there was a duel between No. 55 Rouen GSK 1 and No. 6 CRG Spa. Although faster, the Italian team struggled to overcome the French team. Rouen GSK 1 took advantage of their experience of endurance to ensure the lead position while their rival encountered several problems. However, CRG Spa was still threatening and when Rouen GSK 1 faced some problems within two hours of the finish, the suspense was revived again. It was not until the last few metres of the race that Rouen GSK 1 confirmed their victory over CRG Spa, a formidable opponent who set the fastest lap in the race and finished less than 50” away after 1374 laps, or 1901 km, had been covered. The No. 1 Sodikart team had to manage some mechanical problems at night and gave their utmost to return from 10th to the 3rd position in front of No. 16 CMCR Charente MMA and No. 40 Energy Corse. In addition to the battle of the manufacturers, two of the major engine manufacturers, TM Racing and IAME, competed for the first time directly in Endurance. In this field where mastery of all parameters is paramount, a Vortex engine developed by the French tuner Cédric Sport finally triumphed. 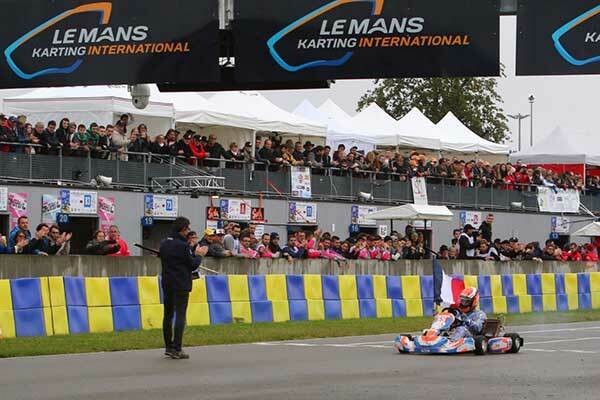 The sporting interest of the 24 Hours Karting was also centred on the GP2 category, whose event counts for the award of the French Cup for GP2 at the end of the season, and its 22 teams were elbow to elbow for 24 hours using their Rotax Max engines. The competition was exciting, even though a team dominated the race from start to finish. The No. 95 FJF Performance (Sodi / Rotax) never left the lead before finishing 8th overall with 1358 laps. Behind the GP2 winner, the contenders succeeded one another. The No. 11 Belinois Jac Kart (Sodi / Rotax), No. 75 Paris KMD (Sodi / Rotax) and No. 36 Cormeilles KMD (Sodi / Rotax) competed for places of honour for a long time at the until the finish. Lydie Valichon, Cathy Briffa, Caroline Martel and Léonie Claude finished 26th after many adventures and the Handikart team No. 84 SRT41 Adrikart – Sodi / Rotax / LeCont of Adrien Turkawka, Maxime Léger, Omar Megari and Snoussi Ben Moussa reached their goal by finishing 28th with 1276 laps covered. Notice is given to all karting enthusiasts in 2018 for a 33rd edition of the 24 Hours Karting which is already very much awaited.